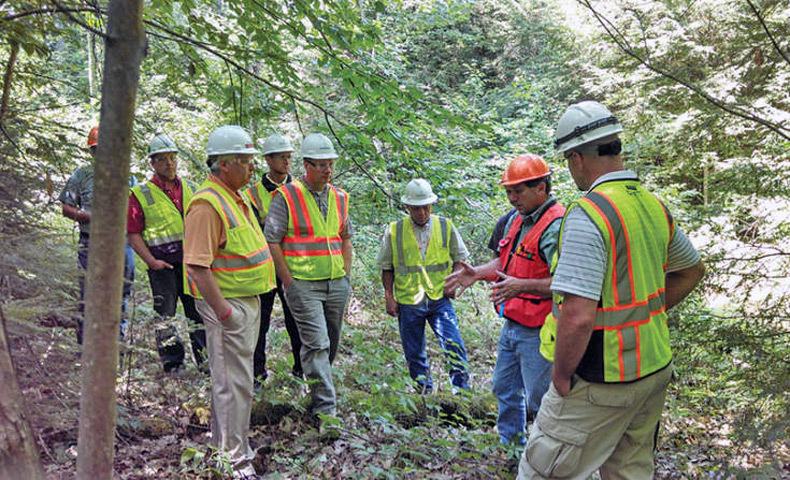 A group of representatives (above) from the Nekoosa and Rothschild mills traveled to Neopit, Wisconsin, in 2014 to tour the Menominee Tribal Enterprises sawmill, manufacturing facilities and forest. The group was greeted by tribal leaders, who gave a presentation on the rich history of the Menominee people and the role that the sawmill and sustainable forestry principles have played in its culture. Climate change, deforestation, global warming. These are all hotly debated sustainability issues that have become commonly used buzzwords in the public discourse. However, news coverage and analysis often focus more on the technical aspects of these key issues and less on the human implications. For example, deforestation contributes to global carbon emissions, but what direct impact is it having on the 300 million people who call forests home? As part of our Sustainable Forestry Principles, Domtar is committed to working closely with local indigenous communities — who make up nearly half of the 300 million residents who live in forests — to ensure the forests remain for generations to come. Our Sustainable Forestry Principles are an integral component of EarthChoice, our broader sustainability platform, which embodies the company’s commitment to full circle responsibility. These principles ultimately govern Domtar’s fiber-procurement processes by requiring transparency, collaboration and accountability in all of our transactions. A guiding tenet of our Sustainable Forestry Principles is to respect the culture and rights of indigenous people. To accomplish this, Domtar’s strategy is twofold: We maintain collaborative relationships with aboriginal communities, and we encourage suppliers to do the same. The Menominee Indian Tribe has lived in the area now known as Wisconsin for more than 10,000 years, depending on the land for their survival. Domtar has roots in the community as well; our two mill facilities in the northern part of the state can trace their histories back more than one hundred years. Domtar respects this rich history and culture, and our Rothschild and Nekoosa, Wisconsin, mills work hand-in-hand with Menominee Tribal Enterprises (MTE), the business arm of the Menominee Indian Tribe of Wisconsin, to ensure mutually beneficial operations in this shared landscape. Domtar has worked with MTE, a major wood supplier, to not only protect the forestland in the area but to support the community through job creation as well. Specifically, Domtar has helped MTE achieve certification under the Forest Stewardship Council (FSC) program, along with its chain-of-custody handling of wood products. FSC certification ensures that forests are well-managed, that habitats are protected and that local communities’ rights are respected. This partnership is evidence of a strong two-way relationship that benefits both the local tribe and workers in Domtar’s mills. Beyond the bottom line, Domtar supports the communities in areas in which they share common public lands. Domtar supports local powwows and educational outreach programs, as well as literacy initiatives through a partnership with First Book. A further example is the work being done in Ontario by Outland Camps, Inc., in partnership with Domtar and others. Outland’s regional manager, Dave Bradley, works with the program’s partners to increase engagement and awareness of the First Nations Natural Resources Youth Employment Program (FNNRYEP). This program is designed to provide First Nations youth an opportunity for hands-on learning in the resource sector with a focus on forestry. It also helps provide a pathway for success in education and in their careers. Since 2000, FNNRYEP has supported youth participants from 50 First Nations communities in northwestern Ontario, including those near Domtar’s Dryden, Ontario mill operations. With Domtar’s support over the past 15 years, the program has graduated nearly 400 First Nations youth and placed youth in more than 850 seasonal job placements, including opportunities with the Forestlands team at the Dryden Mill. Domtar’s involvement with First Nations goes well beyond the First Nations Natural Resource Youth Employment Program. Domtar works with First Nations communities to build relationships that address issues and concerns. One of the priorities of Domtar’s Forest Policy is to work with indigenous peoples, and we do this by making it a priority to develop and maintain working relationships in forest management and wood fiber processing where we share common public lands with aboriginal communities. This leads to many mutually beneficial business arrangements and a variety of community-relations activities. Examples include First Nations businesses that work in partnership with the Dryden Mill to provide fiber to the facility and build harvest access roads. Although Domtar’s track record in these relationships and meetings is assessed as part of the requirements for independent third-party forest certification, Domtar believes that ongoing work with our First Nations communities is integral to our day-to-day business. As the saying goes, it takes a village. And that’s why Domtar encourages its suppliers to develop and maintain working relationships with indigenous and other local communities. This helps ensure the benefits of their operations remain in the local communities. Such a collaborative, integrated approach creates long-term value for not only Domtar and its partners, but also for the communities where forestry operations drive jobs and economic growth. Paige Goff, vice president of sustainability and business communications at Domtar, wrote this article. It was originally published in a slightly different form on greenbiz.com, which promotes opportunities at the intersection of business, technology and sustainability.